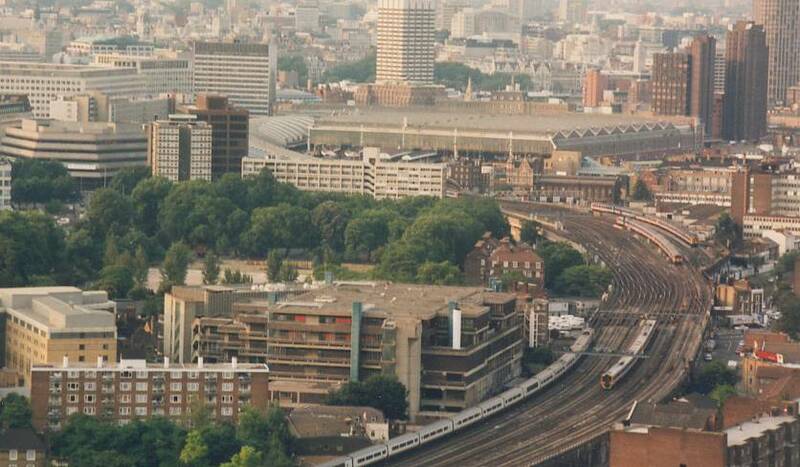 The above photo, taken from a balloon over Spring Gardens, shows the railway line up from Vauxhall to Waterloo Station with a Eurostar train to the left and suburban trains to the right. The Metropolitan extension to Waterloo was opened in 1848 taking a sinuous course to avoid the Vauxhall Pleasure Gardens, a gas works and Lambeth Palace. In order to build across the marshy terrain, the rail lines needed to be built on top of a brick viaduct – whose 290 arches are still visible today. The tradesmen were so efficient at building these that the arch across Miles Street is said to have been built - with its tricky angle and 90,000 bricks - from scratch in just 45 hours. Nine Elms in due course contained a large and complex area of railway sidings as well as significant manufacturing and repair facilities. See below to read about Nine Elms' role in the development of the electric telegraph. The electrification of Waterloo's suburban railway lines continued throughout 1914 and 1915, despite the diversion of men and materials to the war effort. The first train ran from Waterloo to Wimbledon on 25 October 2015. All 51.5 route miles into the Thames Valley were completed by June 1916, at a total cost of £1.4m, including £0.3m for a new power station at Durnsford Road in Wimbledon. The Northern Underground Line was opened in the 1870s. It now serves 50 stations and carries just over 200 million passengers each year. 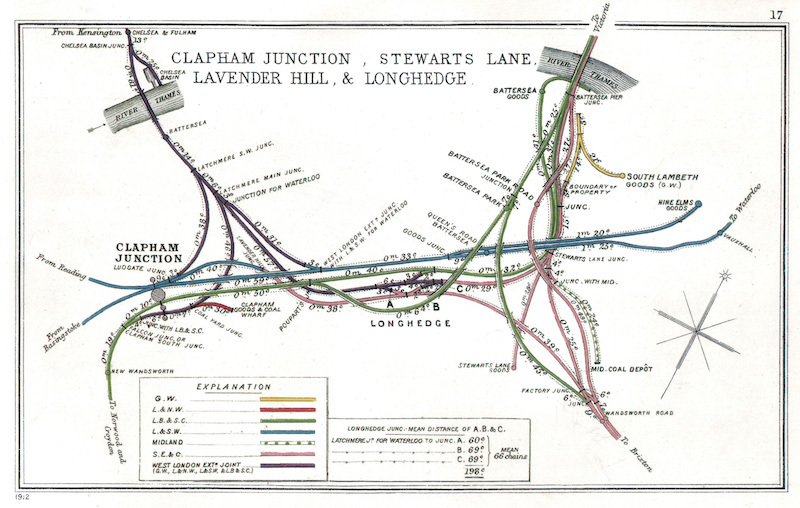 The tunnel from Morden to East Finchley via the City is over 17 miles long. 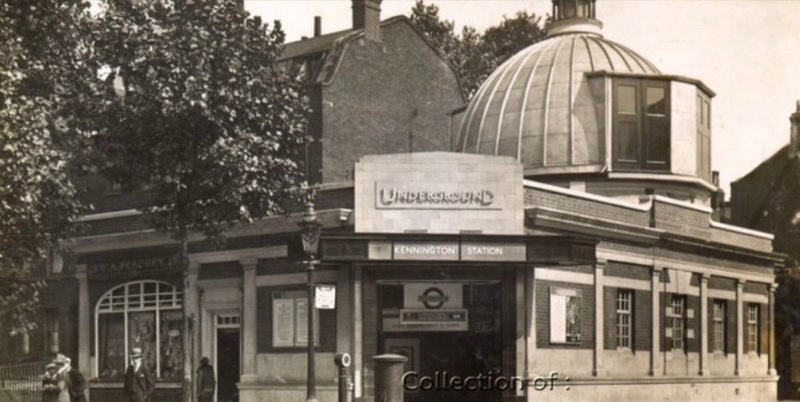 One of our local stations - Kennington, with its beautiful dome - is the oldest surviving station on the Underground. 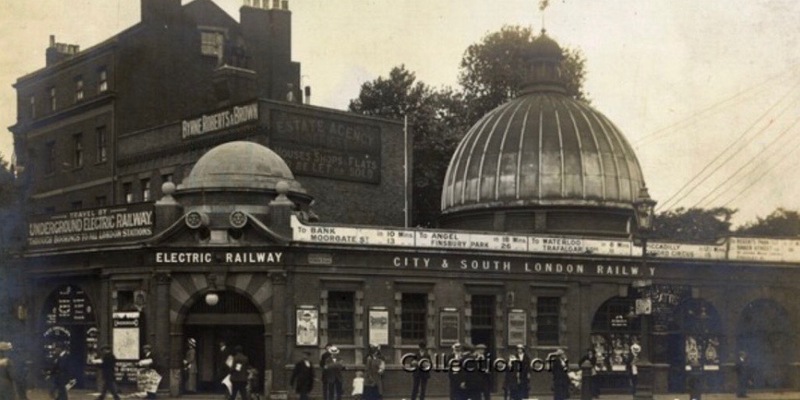 Here are old photos of Oval and Kennington Stations. And here is a later map showing the extended, fully integrated, and now rather complex, Northern Line. 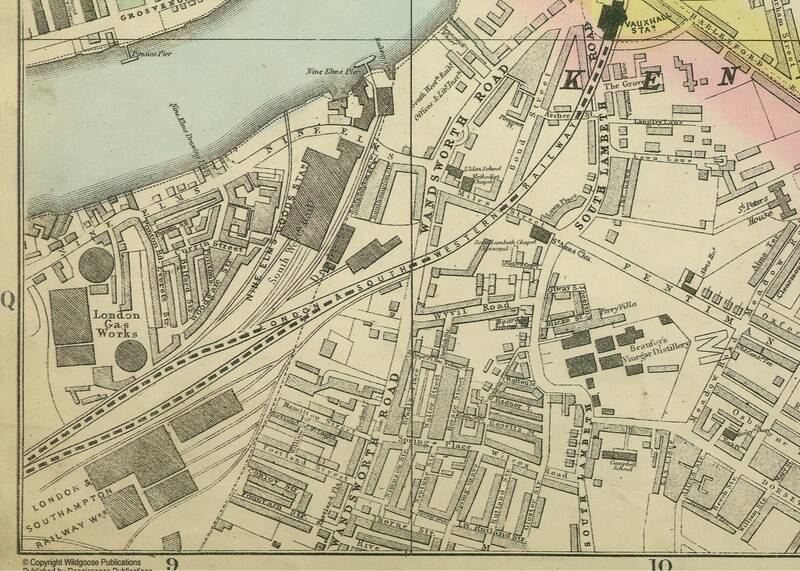 The Necropolis Railway - see further below - ran through Vauxhall between 1854 and 1941. 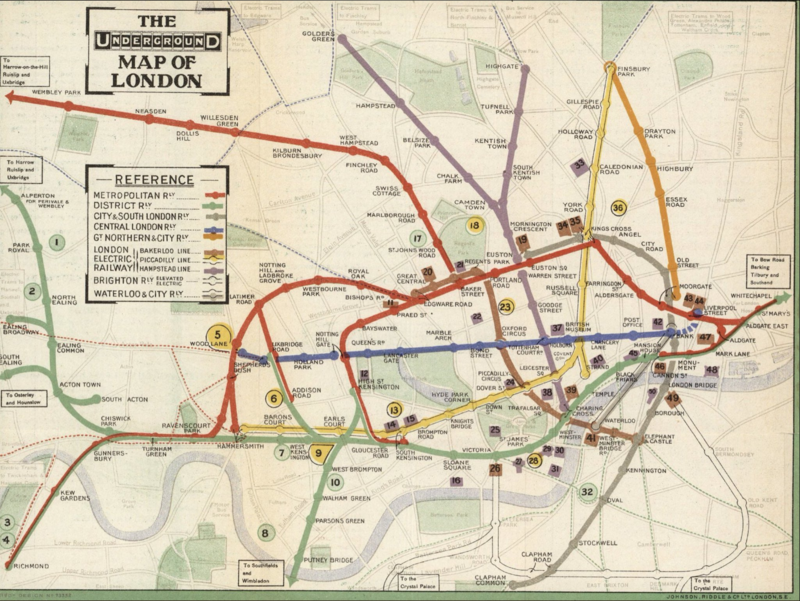 The Victoria Underground Line opened in July 1971, to complaints from residents that the noise from trains running under their homes was very disturbing. The ground around the escalator shaft at Vauxhall station, near the river, was so soft that it had to be frozen before the tunnel could be driven through it! The Victoria Line was one of the first tube lines to run all night at weekends - from August 2016. 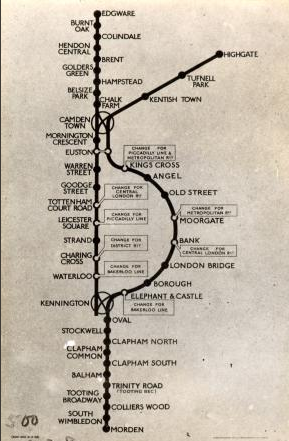 The Northern Line followed a few months later, but via Charing Cross only. Eurostar services to Paris and Brussels began in 1994, running from Waterloo through Vauxhall down to the Channel Tunnel. The service was transferred to St Pancras International in 2007. Over 800 trains (i.e. 400 each way) now pass through Vauxhall station each day on their way between Clapham Junction and Waterloo. Clapham Junction is the busiest station in Britain, if you include trains (to/from Victoria & Waterloo) that do not stop. Birmingham New Street has more trains that stop. The word "Vauxhall" was adopted as the Russian word for railway station. Click here to learn why this happened. 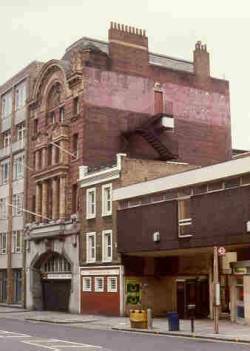 The entrance to the Necropolis Station can still be seen at 121 Westminster Bridge Road (see photo on left) but the station has not been used since it was bombed in April 1941. However, a special funeral train ran from Waterloo in 1979, carrying the body of Earl Mountbatten. The Brookwood service briefly competed with a similar funeral railway service which ran from Kings Cross to New Southgate from 1861 to 1863. Brookwood won out mainly because it had opened first, had agreed lower charges with the owner of the railway lines, and by 1861 had already entered into contracts with many London parishes. Further information about the Cemetery Railway can be found at the Brookwood Cemetery website. Nine Elms played a significant role in the development of the electric telegraph when WF Cooke erected a long private line of electric telegraph between Whitehall in London and the naval headquarters at Portsmouth alongside of the London & South-Western Railway - replacing a redundant naval semaphore apparatus with Cooke & Wheatstone's new Telegraphic System of two-needle instruments and overhead wires. 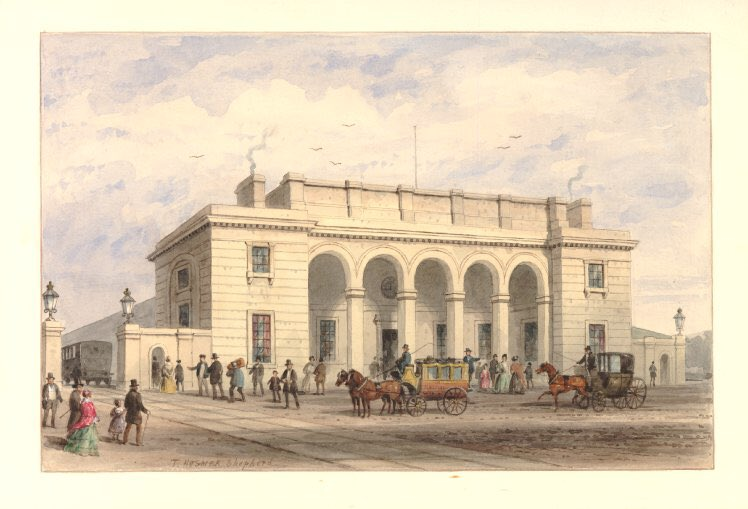 As part of this deal he obtained rights for parallel wires for railway messages and for public messages which extended over the entire system of the London & South-Western company - in particular to the port city of Southampton, the gateway to the Mediterranean Sea and India. It was intended that two of the four wires erected between London and Gosport (for Portsmouth) be used for Admiralty traffic and two for railway and for public messages, with a further two-wire public branch circuit to Southampton. This, the first long-distance circuit in Britain, opened from Nine Elms through to Southampton and Gosport in February 1845. 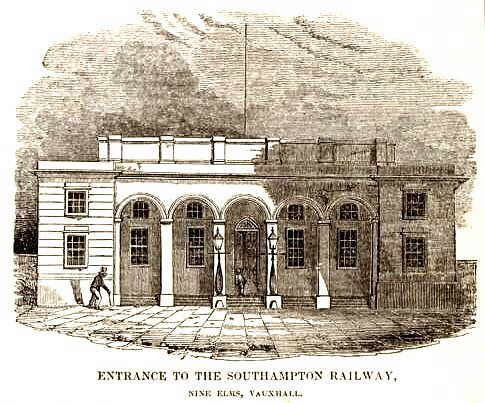 The first trial of part of the Southampton 'long line' took place successfully between Nine Elms and Bishopstoke in Hampshire as the construction works were still in progress in January 1845. On January 31 Cooke travelled to Gosport to complete the two 88 mile two-wire circuits. At 10 o'clock in the evening he telegraphed the clerk at Nine Elms using the two-needle telegraph. The clerk, unfortunately, had dozed off in front of the fire waiting for the first signal. To Cooke's relief the response eventually came back four minutes after ten. On the following day, February 1, Wheatstone went to Nine Elms and began a series of experimental messages back and forth to Gosport with the two-needle apparatus, all of which were successful. He also took the opportunity to try his new 'electro-magnetic' or dial telegraph, worked by a magneto, hence without batteries. This required only a single wire; with one dial instrument in circuit at Nine Elms a return was arranged by connecting two wires of the long line at Gosport. It too was successful. In February 1845 the Queen's Speech on the annual opening of Parliament was transmitted from Nine Elms to Portsmouth, at eighty-eight miles the longest circuit then possible in England. The speech contained 3,600 letters and took two hours to transmit, at the rate of 300 letters a minute. 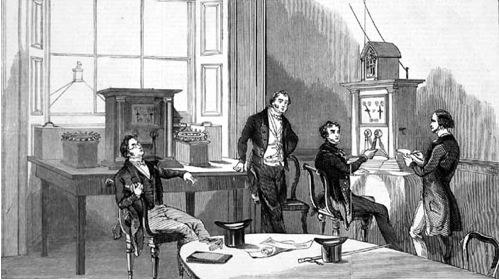 There was then a carefully-staged 'on-line' telegraphic chess event on April 10, 1845 to publicise the dial telegraph. Two prominent chess players, Howard Staunton and Hugh Alexander Kennedy, took on a team of six amateur players; the experts playing white in Gosport, the amateurs, with black, at Nine Elms. Staunton happened, coincidentally, to be chess correspondent of the Illustrated London News which gave lavish coverage to the exercise - see illustration opposite. The match lasted from 11.30am until 7pm and, after forty-three moves, ended in a draw. The Distant Writing website contains a wealth of further interesting information about the history of telegraph companies in Britain between 1838 and 1868. And the Admiralty Optical Telegraph used to run nearby.